Life history traits play critical roles in population survival and evolution. Breeding information should be particularly detailed in order to provide significant insights into the population status and the evolution of other traits. To our knowledge, there is still no information about the breeding biology of Spectacled Parrotbill (Sinosuthora conspicillatus), an endemic parrotbill in China. We searched the nests, checked all nests found and recorded the information of eggs, nestlings and nest sites of the Spectacled Parrotbill from 2013 to 2015 at Lianhuashan National Nature Reserve in Gansu Province, China. A total of 16 nests were found. Nest trees were artificial young spruces and honeysuckles. Mean nest height was 0.89 ± 0.47 m (n = 16) above the ground level. All nests were cup-shaped and constructed using leaves, fine strips of barks and grasses by both parents. The mean clutch size was 4.42 ± 0.79 (n = 12). The eggs were oval in pale blue without speckles, and the mean egg mass was 1.25 ± 0.07 g (n = 27). The egg length was 15.56 ± 0.46 mm (n = 27) and the width was 12.46 ± 0.29 mm (n = 27). Incubation period was 13 days and nestling period was 13–14 days. The breeding success rate was 46%, and among those failed nest, 71% were depredated and 29% were deserted. Detailed life history information about parrotbill is still limited. The breeding biology of Spectacled Parrotbill reported in the present study should be helpful for further research about population, breeding behavior and conservation of this bird. The evolution of life-history is mainly determined by the trade-off between key life-history traits to optimize the fitness, which should play critical roles in the survival and reproduction of birds (Lack 1948). Therefore, understanding variation between key traits among species has always been the main research subject of avian life-history evolution (Partridge and Harvey 1988; Martin 2004, 2015). Life history traits associated with reproduction, such as clutch size, egg colors and nest sites, can provide insights into resolving problems related to assessing population status and conservation (Martin 2002). Parrotbills are mainly distributed in China, where 19 species have been found (Alström et al. 2006, 2013; Robson 2014; Zheng 2017). Among them, the Three-toed Parrotbill (Cholornis paradoxus), Spectacled Parrotbill (Sinosuthora conspicillata), Rusty-throated Parrotbill (S. przewalskii) and Grey-hooded Parrotbill (S. zappeyi) are endemic to China (Lei and Lu 2006; Robson 2014; Zheng 2017). Until now, life history information about this group is limited. Detailed breeding information is available in only six species, including Vinous-throated Parrotbill (Sinosuthora webbianus; Kim et al. 1995; Guo et al. 2006; Lee et al. 2010; Lee and Jabloński 2012; Robson 2014), Reed Parrotbill (Paradoxornis heudei; Wang and Zhou 1988; Dong et al. 2010; Boulord et al. 2011), Grey-hooded Parrotbill (Jiang et al. 2009), Ashy-throated Parrotbill (S. alphonsianus; Yang et al. 2010), Golden Parrotbill (Suthora verreauxi; Yang et al. 2011) and Fulvous Parrotbill (S. fulvofrons; Hu et al. 2014). There are also a few descriptions about the nests or eggs in 10 species, such as Great Parrotbill (Conostoma oemodium), Brown-winged Parrotbill (Sinosuthora brunneus) and Black-breasted Parrotbill (Paradoxornis flairostris; Li et al. 2014; Robson 2014; Zhu 2014). The Spectacled Parrotbill is a relatively small and long-tailed parrotbill, which contains two subspecies, the nominated subspecies S. c. conspicillatus and S. c. rocki. It only occurs in quite limited areas in China, and the Lianhuashan National Nature Reserve is the center of this bird’s distribution area (Zhao 2001). To our knowledge, there is still limited breeding information of the Spectacled Parrotbill (Zhao 2001; Robson 2014). In this study, we described the breeding biology of this bird in detail. Our study was conducted in the experimental zone of the Lianhuashan National Nature Reserve in Gansu Province, China (34°57′–34°58′N, 103°46′–103°47′E, Fig. 1). The altitude ranges from 2200 to 2400 m a.s.l. The annual precipitation is about 650 mm, which is largely concentrated during the summer (from June to August). Snow cover lasts from November to early April in the following year. Mean annual temperature is about 5.1–6.0 °C, with a maximum of 34 °C and a minimum of − 27.1 °C (Sun et al. 2008). The study area is 300 ha, fragmented by patch agricultural lands. The habitat is mainly covered by shrubs, which consists of many kinds of willows (Salix spp. ), sea buckthorns (Hippophae rhamnoides), roses (Rosa spp.) and honeysuckles (Lonicera spp. ), and some arbor trees distributed sporadically around the sites, including oaks (Ouercus liaotungensis), spruces (Picea asperata), firs (Abies fargesii) and birches (Betula utilis) (Sun et al. 2008). We conducted our field study from May to August in 2013, and from April to August in 2014 and 2015. We searched the nests using combined methods (vocal and individuals’ clues) of systematically searching all trails throughout the study area (Martin and Geupel 1993). When an active nest was located, we marked the position with blue rubber belt 10 m away from the nest, and then we checked all nests at every 3–5 days to record the laying date of first egg, clutch size, and hatching date. The first-egg date was estimated by the observed hatching date and egg mass (unpublished data), and hatching date was estimated by nestling mass (unpublished data). Shortly after completion of clutches, we measured egg weights to the nearest 0.01 g with a portable electronic scale, and egg size to 0.01 mm with vernier caliper. We calculated the minimum mean clutch size from observed number of nestlings and or eggs, assuming no more eggs were laid or nestlings hatched (Jiang et al. 2009). We measured nestling mass every other day in order to monitor nestling growth and measured other body measures (such as beak length, tarsus length, wing length) when nestlings were 10 days old. We observed the nest attendance behavior using cameras (AONI Q721 mini camera, Shenzhen, China) and 10 × 25 binoculars at a distance of 10–15 m to reduce human disturbance. 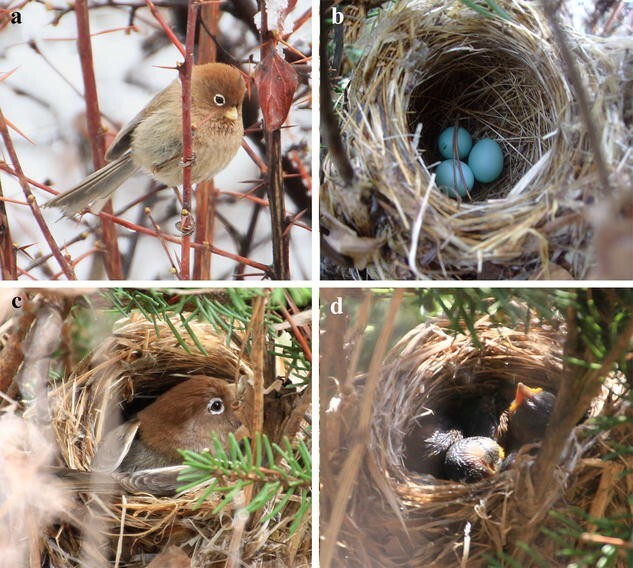 We defined successful nests as those having at least one nestling fledged and unsuccessful nests as those abandoned or depredated (Yang et al. 2011). We also sampled plant coverage around nest sites, nest height above ground, and tree species and height as illustrated by Hu et al. (2017). The coverage and nest size were measured after nestlings fledged or nest fate was confirmed. Finally, the nests and their contents were collected. Sample sizes varied for different parameters because we could not inspect and measure all the nests regularly. We did not find enough nests each year to compare the number of nests among years, so we pooled all 3 years’ data together. All the data were presented as mean ± standard deviation in the following. We found a total of 16 nests during 3 years (1 nest in 2013, 6 in 2014, and 9 in 2015), and almost all nests (except 2 nests) were distributed within a 300-ha area (Fig. 1). All nests were located in the shrubs. Shrub coverage around the nests was 45% in average (n = 16). The main nest trees were artificial spruce saplings (6 nests) and honeysuckles (4 nests). The height of nest trees averaged 1.57 ± 0.53 m (range: 0.8–2.6 m, n = 16), and nest height was 0.89 ± 0.47 m (range: 0.4–2.3 m, n = 16) above the ground level. Nests were cup-shaped (Fig. 2b–d), and the outer and inner diameter of the nest were 8.00 ± 0.76 and 4.62 ± 0.49 cm (n = 6), respectively. The inside depth was 5.20 ± 0.13 cm and the outside height was 8.30 ± 0.41 cm (n = 6). Nest materials mainly consisted of leaves, fine strips of bark and some grasses. The interior of nest was normally covered with finer materials, occasionally with animal hair (Fig. 2b). Nests were constructed by both sexes over a period of several days (11 days in one nest). Parrotbills approached the nest sites cautiously and inspected the surroundings when they brought materials. Of the 16 nests, 14 were active. Among them, one nest was found with eggs in 2013; two nests were found after the completion of nest construction, two nests were found with eggs and two nests with nestlings in 2014; two nests were found during the nesting period, three nests were found with eggs, two nests with nestlings, and two nests were empty in 2015 (Table 1). The first egg laying dates were mainly in April (n = 7) and May (n = 6), with only one in June. Eggs were laid 2–3 days after the completion of nest construction (n = 3). Egg laying happened normally in the morning before 10:30 (n = 10), and eggs were laid once per day (n = 5). The clutch size was 4.42 ± 0.79 eggs (range: 3–5 eggs, n = 12). We found a total of 55 eggs in 13 nests and measured 27 eggs in 6 nests. The eggs were oval shaped and in pale blue color without spots (Fig. 2b). The mean egg mass was 1.25 ± 0.07 g (range: 1.03–1.36 g, n = 27), the mean egg length was 15.56 ± 0.46 mm (range: 14.72–16.49 mm, n = 27), and the mean egg width was 12.46 ± 0.29 mm (range: 11.97–13.01 mm, n = 27). Incubation began when clutches were completed, and all lasted 13 days (n = 3). The nestling periods was 13–14 days (according to data of 2 nests). Based on measurements of four nestlings from one nest, the chick mass was 1.48 ± 0.35 g at the first day, 2.56 ± 0.09 g at the second day, 5.57 ± 0.91 g at the fifth day, 7.09 ± 0.68 g at the seventh day, and 7.90 ± 0.94 g at the tenth day. At ten-day age, the beak length, body length, wing length, tarsus length, tail length was 6.37 ± 0.24, 42.95 ± 4.42, 31.76 ± 3.20, 21.20 ± 0.32 and 10.91 ± 3.07 mm, respectively. Among the 14 active nests, the fate of one nest was unknown, six nests fledged successfully, two nests were deserted during egg laying period, three nests were destroyed by predators during incubation, and two nests were depredated during the nestling stages. As recorded by cameras (n = 5, including nests No. 2, 6, 7, 12 and 13 in Table 1), nestlings were depredated by a Red-winged Crested Cuckoo (Clamator coromandus) in one nest. The rate of nest success was 46% (6/13). Among those failed nests, nest predation rate was 71% (5/7), accounting for nearly three quarters of nest failure, and nest desertion (29%, 2/7) accounted for other one quarter of nest failure. This study descripted breeding information of Spectacled Parrotbill in detail. Spectacled Parrotbill nested in many kinds of habitat types, mainly in shrubs. Both parents constructed nest with materials of leaves, barks and animal hairs. Their eggs were pale blue eggs without speckles, both incubation and nestling periods were about 13 days long, and rate of nest success was almost 50%. The breeding pattern of Spectacled Parrotbill was similar to other parrotbills, but they also had their own roles. The Spectacled Parrotbill can construct their nests in various kinds of habitats, making them distribute relatively wider than bamboo-habitat specialized parrotbills. The breeding habitats of other known parrotbill species are normally limited to bamboo thickets or closely associated with reed habitats, such as Grey-hooded Parrotbill (Jiang et al. 2009), Fulvous Parrotbill (Hu et al. 2014) and Reed Parrotbill (Boulord et al. 2011; Xiong and Lu 2013). Normally, habitat specialists have limited distribution ranges with weak dispersal abilities and specific habitat requirement, sensitive to habitat disturbance or fragmentation (Warren et al. 2001; Julliard et al. 2006). Unlike the habitat specialists, the Spectacled Parrotbill is a kind of habitat generalist, which inhabits in dense grass, shrub or bamboo and reed habitat, making their population less sensitive to habitat disturbance. This is also found in Ashy-throated Parrotbill and Vinous-throated Parrotbill (Kim et al. 1995; Yang et al. 2010, 2011). Spectacled Parrotbill has a moderate nest predation rate (38.46%), but accounting for a large proportion of the nest failure (71.43%), which was much higher than that of Golden Parrotbill (44.44%) and Fulvous Parrotbill (18.18%) (Yang et al. 2011; Hu et al. 2014). This may relate to their different nest habitats, because Spectacled Parrotbill builds their nests in shrubs, which are more easily detected by predators, while the latter two build their nests within the bamboo thickets (Yang et al. 2011; Hu et al. 2014). Furthermore, the clutch size of Spectacled Parrotbill (4.42 ± 0.79, n = 12) was larger than Golden Parrotbill (3.50 ± 0.67, n = 12; Yang et al. 2011), Fulvous Parrotbills (3.38 ± 0.72, n = 16; Hu et al. 2014) and Grey-hooded Parrotbill (3.16 ± 0.8, n = 8; Jiang et al. 2009). The high nest predation in Spectacled Parrotbill may relate to their relatively large clutch size, because visiting rates of insectivorous birds were correlated to the number of eggs and nestlings, and high visiting rates may incur more predation risk (Skutch 1949; Martin 2015). We therefore suggest that the larger clutch size and nest habitat may play important roles in explaining nest predation of Spectacled Parrotbill. Unfortunately, we have little data for parental care of these species so further comparisons are impossible. In regard to the nest desertion rate, Spectacled Parrotbill (28.57%) is also higher than that of Golden Parrotbills (16.67%), but lower than that of Fulvous Parrotbill (66.67%) (Yang et al. 2011; Hu et al. 2014). The high rate of nest desertion in Fulvous Parrotbill was caused by tourist activities in Wawushan Nature Reserve (Hu et al. 2014). As to Spectacled Parrotbill, the nest desertion may be due to the human activities from consecutive disturbance of observers or passers-by and existence of cameras, or due to the existence of predator (personal observation), which needs further investigation. Spectacled Parrotbill has pale blue and immaculate eggs, which is in accordance with the closely related Grey-hooded Parrotbill (Jiang et al. 2009; Yeung et al. 2011), Golden Parrotbill (Yang et al. 2011), and Fulvous Parrotbill (Hu et al. 2014), but is different from some larger parrotbills, which have speckled eggs (Chen et al. 2016). The mechanisms of egg colors are complex. Although we did not observe egg polymorphism and brood parasitism in Spectacled Parrotbill, we cannot exclude that egg color may be driven by parasitism (Yang et al. 2010). Other mechanisms, like cryptic hypothesis (Underwood and Sealy 2002) and post-mating sexually-selected hypothesis (Moreno and Osorno 2003), are still remained to be explored. In present study, we reported the breeding information of Spectacled Parrotbill, including nest site, clutch size, nest construction, egg, nestling and nest fate, which should be helpful for further research about population and conservation of this bird. LC, LZ, YH and PL conducted field works, LC, NL and YS analyzed the data and drafted the manuscript. All authors read and approved the final manuscript. We thank the staff of the Lianhuashan Nature Reserve for their assistance in the field. The datasets used in the present study are available from the corresponding author on reasonable request. The experiments comply with the current laws of China in which they were performed. Our study was supported by the National Natural Science Foundation of China (31472012, 31270468).